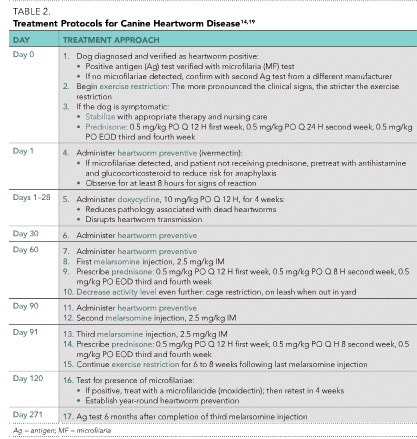 From the asymptomatic dog with a few heartworms to the patient with advanced heartworm infection and caval syndrome, heartworm disease (HWD) presents a range of treatment challenges. The keys to implementing therapeutic protocols recommended by the American Heartworm Society (AHS) include understanding the disease and the role different medications play in treatment. A thorough understanding of the host–parasite relationship is necessary to effectively manage canine heartworm cases. As expected, the number of worms affects the severity of disease, but of equal, if not greater importance, is the activity level of the dog. A controlled study demonstrated that exercise- restricted dogs infected with 50 heartworms by surgical transplantation took longer to develop clinical disease and developed less severe pulmonary vascular pathology than dogs with 14 heartworms that were allowed moderate activity. Whereas live heartworms can cause endarteritis and arteriolar muscular hypertrophy of primarily the caudal pulmonary arteries, the majority of pathology seen in acute clinical disease is caused by dying heartworms. As worms die of either natural causes or because of administration of adulticidal drugs, they decompose, causing small worm fragments to lodge in the distal pulmonary arterioles and capillary beds. These worm fragments, along with inflammation and platelet aggregation, result in thromboemboli that block blood flow, particularly in the caudal lung lobes. During periods of increased activity or exercise, the increased blood flow to these blocked vessels can cause capillary delamination, rupture, and subsequent fibrosis and, ultimately, further increases pulmonary vascular resistance, contributing to development of right-sided heart failure.3 This illustrates again the direct correlation between a dog’s activity level and severity of disease and its importance when determining how to treat the heartworm-positive dog. Pre-Adulticide Evaluation: This evaluation includes a thorough history, physical examination, and confirmatory antigen or microfilarial test. A complete blood count, serum biochemical profile, and thoracic radiography to thoroughly assess the patient for coexisting disease, which may affect the outcome or safety of treatment, are recommended. However, they are not predictive of posttreatment complications or success. Signs of right-sided congestive heart failure. Weeks 3 and 4: 0.5 mg/kg PO QOD. In chronic disease, right-sided congestive heart failure may result from interstitial fibrosis obliterating pulmonary capillary beds or, in acute disease, from thrombosis in small pulmonary arterioles. Right-sided congestive heart failure may be treated with furosemide and angiotensin-converting enzyme inhibitors. There are no published data about the use of drugs, such as pimobendan or sildenafil, in these cases. If the patient is ascitic, abdominal drainage may be considered and instituted during the first 2 months of the treatment protocol described later in this article. Treatment: The AHS treatment protocol for canine patients includes the sequenced administration of several medications (see Drugs Used in Heartworm Treatment). Melarsomine administration is based on class of HWD (Table 1). The 2-injection protocol listed on the melarsomine product insert treats classes 1 and 2 HWD but kills only 90% of adult worms, while the 3-dose alternate protocol that treats class 3 HWD kills 98% of worms (Table 2). The AHS recommends the 3-dose protocol in all heartworm cases, regardless of class, owing to increased efficacy and safety. When treating a heartworm-positive dog, the dog may be harboring heartworms at different stages of development—from larvae < 1 month of age to adults > 5 years of age. The goal of eliminating all worms in a patient presents a treatment challenge because of limited knowledge about the effects of melarsomine against heartworms < 4 months of age. Macrocyclic lactones are effective for larvae < 2 months of age when given for consecutive months.5 The Figure illustrates the susceptibility gap between macrocyclic lactones and melarsomine. This gap can be eliminated by administering a macrocyclic lactone preventive for 2 months before administering melarsomine. This step eliminates tissue stages (third- and fourth- stage larvae) > 2 months of age and also allows worms between 2 and 4 months to reach an age at which they are known to be more susceptible to melarsomine. Macrocyclic lactones administered as microfilaricides may cause a rapid decrease in the number of microfilariae and, therefore, should be used with caution in dogs with high microfilarial counts. In these patients, pretreatment with antihistamines and glucocorticosteroids is advisable to minimize potential reactions. Administration of a macrocyclic lactone should begin as soon as a dog is diagnosed with a heartworm infection. Including doxycycline in the treatment protocol hastens the elimination of microfilariae, and current protocols that use doxycycline in combination with regular preventive doses of macrocyclic lactones have essentially eliminated the need for postadulticidal elimination of microfilariae. Topical moxidectin is approved by the FDA to eliminate microfilariae. No adverse reactions due to high microfilaria counts were observed in laboratory or field studies conducted for approval of this label claim. Anecdotal reports on other macrocyclic lactones with adulticidal properties suggest similar results, but no confirmatory studies have been published. Pulmonary thromboemboli are an unavoidable sequela of any adult heartworm treatment protocol, and they are primarily worm fragments complicated by inflammation rather than the actual clots seen in pulmonary thromboembolism in humans. Prednisone has been shown to reduce parenchymal and arterial wall pathology.13 While it has been suggested that glucocorticosteroids reduced the adulticide effect of thiacetarsamide,16 no such phenomenon has been observed with melarsomine.17 Prednisone is recommended following administration of melarsomine in all dogs unless contraindicated because of concurrent medical conditions. Table 2 outlines treatment protocols that were adopted by the AHS. These protocols are appropriate for dogs with Classes 1 through 3 HWD. Surgical removal of heartworms is the only course of action available for dogs with Class 4 HWD. It has also been advocated for severe class 3 cases that need immediate intervention or have hepatic or renal disease of sufficient severity that arsenical therapy is not advisable. 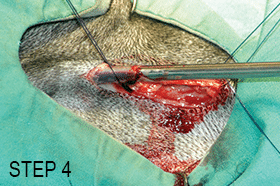 See Step-Wise Approach: Surgical Extraction of Heartworms. 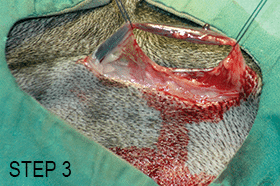 Clip and scrub the area over the right jugular vein. Make an incision over the right jugular vein; then bluntly dissect the subcutaneous tissue and expose the right jugular vein. Pass a loop of suture (#1 nylon or other monofilament) beneath each end of the exposed vein; lifting up on the suture helps control hemorrhage. Make an incision into the vein, and pass a retrieval device21 down the jugular vein to the level of the right atrium. 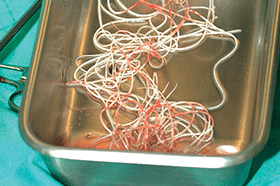 Gently extract worms; 1 to 5 worms are typically removed with each pass depending on the retrieval device utilized.21 Make multiple passes until no worms are retrieved on 3 consecutive attempts. Suture the incision in the jugular vein or tie off the vein above and below the incision. Once the animal is stable and has exhibited improvement in cardiovascular function, treat with the multimodal protocol outlined in Table 2. Some clinicians premedicate with butorphanol and lidocaine; then administer propofol to effect. Others combine physical restraint with local anesthesia over the jugular vein. Slow Kill. In some situations, arsenical- based treatment protocols are not feasible because of pre-existing medical conditions or financial constraints. As a result, it has become common practice to place heartworm-positive dogs on long-term preventives to prevent new infections and slowly kill adult worms over several years (“slow kill”). Microfilariae-based assays as well as in vivo studies have shown that every macrocyclic lactone currently used in commercially prepared preventives has exhibited some degree of failure.27-29 The AHS has concluded that macrocyclic lactones should never be used as stand-alone therapy to treat adult heartworms. Herbal Therapies. No natural or herbal therapy has been shown to be a safe and effective treatment for HWD. While treating HWD in dogs presents a number of challenges, following a protocol designed to eliminate adult heartworms while mitigating complications from worm death can greatly improve the patient’s chances of a positive outcome. Ray AR, Brawner W, Hanrahan L. Influence of number of parasites and exercise on the severity of heartworm disease in dogs. In Sol MD, Knight DH (eds): Proceedings of the Heartworm Symposium. Batavia, IL: American Heartworm Society, 1995, p 113. Fukami N, Hagio M, Okano S, et al. Influence of exercise on recovery of dogs following heartworm adulticide treatment with melarsomine. In Seward RL (ed). Recent Advances in Heartworm Disease: Symposium. Batavia, IL: American Heartworm Society, 1998, pp 225-227. Ray AR, Warner AE, Molina RM. Pulmonary parenchymal changes in dogs and cats after experimental transplantation of dead Dirofilaria immitis. In Sol MD, Knight DH (eds): Proceedings of the Heartworm Symposium. Batavia, IL: American Heartworm Society, 1995, pp 97-101. Keister M, Dzimianski M, McTier TL, et al. Dose selection and confirmation of RM 340, a new filaricide for the treatment of dogs with immature and mature Dirofilaria immitis. In Sol MD (eds): Proceedings of the Heartworm Symposium. Batavia, IL: American Heartworm Society, 1992, p 225-229. McCall JW, Guerrero J, Roberts RE, et al. Further evidence of clinical prophylactic, retroactive (reachback) and adulticidal activity of monthly administration of ivermectin in dogs experimentally infected with heartworms. In Seward RL (ed). Recent Advances in Heartworm Disease: Symposium. Batavia, IL: American Heartworm Society, 2001, pp 189-200. Kozek WJ. What is new in the Wolbachia/Dirofilaria interaction. Vet Parasitol 2005; 133(2-3):127-132. Kramer L, Simon F, Tamarozzi F, et al. Is Wolbachia complicating the pathological effects of Dirofilaria immitis infections? Vet Parasitol 2005; 133(2-3):133-136. McCall JW, Genchi C, Kramer L, et al. Heartworm and Wolbachia: Therapeutic implications. Vet Parasitol 2008; 158:204-211. Bazzocchi C, Mortarina M, Grandi G, et al. Combined ivermectin and doxycycline treatment has microfilaricidal and adulticidal activity against Dirofilaria immitis in experimentally infected dogs. Intl J Parasitol 2008; 38:1401-1410. Grandi G, Quintavalla C, Mavropoulou A, et al. A combination of doxycycline and ivermectin is adulticidal in dogs with naturally acquired heartworm disease (Dirofilaria immitis). Vet Parasitol 2010; 169(3-4):347-351. Kramer L, Grandi G, Passeri B, et al. Evaluation of lung pathology in Dirofilaria immitis-experimentally infected dogs treated with doxycycline or a combination of doxycycline and ivermectin before administration of melarsomine dihydrochloride. Vet Parasitol 2011; 176:357-360. McCall JW, Kramer L, Genchi C, et al. Effects of doxycycline on heartworm embryogenesis, transmission, circulating microfilaria, and adult worms in microfilaremic dogs. Vet Parasitol 2014; 206(1-2):5-13. Atwell R, Tarish JH. The effect of oral, low-dose prednisolone on the extent of pulmonary pathology associated with dead Dirofilaria immitis in a canine lung model. In Sol MD, Knight DH (eds): Proceedings of the Heartworm Symposium. Batavia, IL: American Heartworm Society, 1995, pp 103-111. Nelson CT, McCall JW, Carithers D (eds). Current Canine Guidelines for the Prevention, Diagnosis, and Management of Heartworm (Dirofilaria immitis) Infection in Dogs, 2014. Available at https://heartwormsociety.org/images/pdf/2014-AHS-Canine-Guidelines.pdf. Di Sacco B, Vezzoni A. 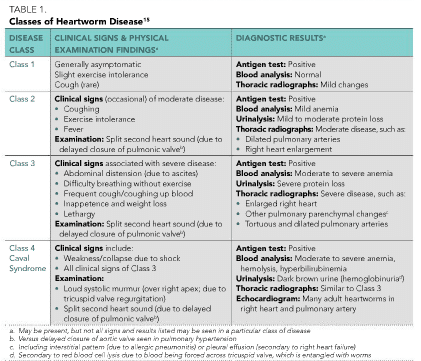 Clinical classification of heartworm disease for the purpose of adding objectivity to the assessment of therapeutic efficacy of adulticidal drugs in the field. In Sol MD (ed): Proceedings of the Heartworm Symposium. Batavia, IL: American Heartworm Society, 1992, p 209- 214. Rawlings CA. Heartworm disease in dogs and cats. In Kirk RW (ed): Current Veterinary Therapy IX. Philadelphia: Saunders, 1986:175-207. Dzimianski M. The effect of prednisone on the efficacy of melarsomine dihydrochloride against adult Dirofilaria immitis in experimentally infected beagles. 13th Triennial State of the Heartworm Symposium, Memphis, TN. April 17, 2010. Boudreaux M, Dillon AR, Ravis WR, et al. Effects of treatment with aspirin or aspirin/ dipyridamole combination in heartworm-negative, heartworm infected, and embolized heartworm–infected dogs. Am J Vet Res 1991; 52(12):1992-1999. Nelson CT. Heartworm disease. In Greene C (ed): Infectious Diseases of the Dog and Cat, 4th ed. Elsevier, 2012, pp 865-877. Nelson CT, Sellers EF. Current recommendations for doxycycline in heartworm treatment and its clinical benefits. Heartworms Today: The Search for Solutions, 2013 Triennial Symposium, AHS Sept 8-10, 2013, New Orleans, LA. Yoon WK, Choi R, Lee SG, et al. 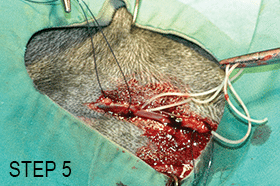 Comparison of 2 retrieval devices for heartworm removal in 52 dogs with heavy worm burden. J Vet Intern Med 2013; 27(3):469-473. Venco L, McCall JW, Guerrero J, Genchi C. Efficacy of long-term monthly administration of ivermectin on the progress of naturally acquired heartworm infections in dogs. Vet Parasitol 2004; 124(3-4):259-268. Bowman D, Johnson C, Ulrich ME, et al. Effects of long-term administration of ivermectin and milbemycin oxime on circulating microfilariae and parasite antigenemia in dogs with patent heart worm infections. In Sol MD (ed): Proceedings of the Heartworm Symposium. Batavia, IL: American Heartworm Society, 1992, pp 151-158. Bowman D, Neumann N, Rawlings C, et al. Effects of avermectins on microfilariae in dogs with existing and developing heartworm infections. In Seward RL (ed). Recent Advances in Heartworm Disease: Symposium. Batavia, IL: American Heartworm Society, 2001, 173-178. Pulaski CN, Malone JB, Bourguinat C. Establishment of macrocyclic lactone resistant Dirofilaria immitis isolates in experimentally infected laboratory dogs. Parasit Vectors 2014; 7:494. Blagburn B, Bowels J, Loechel R, et al. Evidence of genetic selection following treatment of a heartworm infected, microfilaremic dog with increasing dosages of ivermectin. AAVP Proc 58th Annual Meeting, July 20-23, 2013, Chicago IL. Blagburn B, Vaughan J, Butler JM, et al. Evaluation of susceptibility of heartworm (Dirofilaria immitis) biotypes to macrocyclic lactones using microfilariae-based single-dose and dose-mortality regression assays. Proc. AAVP 56th Annual Meeting, July 16-19, 2011, St Louis, MO. Bowman D, Lee A, Harrington LC, et al. Testing the efficacy of an injectable moxidectin formulation against a field isolate of canine heartworm. Proc. AAVP 58th Annual Meeting, July 20- 23, 2013, Chicago, IL. Blagburn BL, Arthur RG, Dillon AR, et al. Comparative efficacy of four commercially available preventive products against JYD-34 laboratory strain of Dirofilaria immitis. Heartworms Today: The Search for Solutions, 2013 Triennial Symposium, AHS Sept. 8-10, 2013, New Orleans, LA. Charles Thomas Nelson, DVM, is the surgical director of the Animal Medical Center, Anniston, Alabama. He is a past president of the American Heartworm Society, former board member of the Companion Animal Parasite Council (CAPC), a member of the International Feline Heartworm Council, and the spokesperson for the KNOW Heartworms Campaign—a joint educational program developed by the AHS and American Association of Feline Practitioners. Dr. Nelson is involved in heartworm research and lead author of the recently released AHS guidelines. He has authored or coauthored numerous papers and contributed to several textbooks on heart- worm disease, including a chapter in the latest edition of Greene’s Infectious Diseases of the Dog and Cat.